At 209 pounds, Kayla Sleigher got motivated to shed the weight after seeing her wedding photos. Now she's 35 pounds lighter thanks to an easy at-home workout plan. At five-foot-seven, Kayla weighed 150 pounds when she was 20 years old. But for the next eight years, she avoided the scale—pushing aside worries about weight gain in order to focus on her son, career and family. In 2004, she met her future husband through mutual friends. 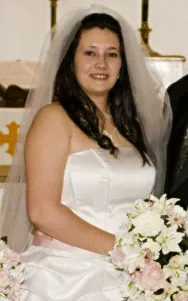 Four years later, she got married, on May 3, 2008. By making simple changes like cutting out soda, eating more protein, and taking walks around her neighborhood, Kayla lost 35 pounds between January and August of 2010. But eventually, Kayla’s motivation started to wane—and her weight loss plateaued. “I didn’t know what program to follow,” Kayla says. “You could research a million weight loss programs for years and still come out confused. I needed someone to set out a whole plan for me.” She thought about joining a gym but the nearest one was 40 minutes away—too far of a commute to justify a membership. Kayla says her weight loss has also allowed her to keep up with her active husband and 12-year-old son. “My husband tried doing one workout with me and couldn’t make it!” Kayla says. Even more impressive: Kayla recently challenged her son to a push-up contest—and she won. With only five more pounds to go until she reaches her goal weight of 137 pounds, Kayla and her husband have their sights set on renewing their vows—and recreating those pictures that Kayla would still rather forget. To learn more about DailyBurn or to try a free 30-day trial yourself, visit DailyBurn.com. Note to reader: The content in this article relates to the core service offered by DailyBurn. In the interest of editorial disclosure and integrity, the reader should know that Life by DailyBurn is owned and operated by DailyBurn. DailyBurn users who worked out for 30 minutes or more at least five times a week for 60 to 90 days reported an average weight loss of about one pound per week.